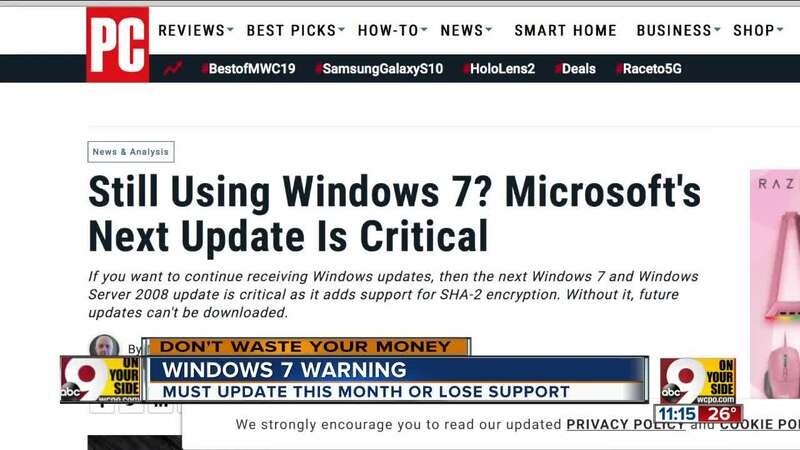 Still use Windows 7 on your PC or laptop? Don't be embarrassed: almost 40% of personal computers around the world still run it, according to Microsoft. But if you still use it, you need to make a very important upgrade soon. Windows 7 is now 10 years old. If you're still using it, watch for a critical update this month. PC magazine says if you don't accept the update, you will lose all support from Microsoft by July. That means no more security patches and updates, leaving you vulnerable to scammers hoping to take over your computer, or malware that quietly loads itself when you visit a questionable website. Make sure Windows Updates are enabled in your settings. Then, make sure you accept the Spring 2019 update. Your other option is to purchase a Windows 10 upgrade. But from the "doesn't that stink" file, the fact that whatever you do, you may have less than a year left to use Windows 7. Unless Microsoft makes a change, it plans to end support for 7 early next year, in 2020, which may have you saying "doesn't that stink?" Worse, upgrading to Windows 10 currently costs $139 . (The free upgrade offer ended 2 years ago). That stinks too, if you are dealing with a 7 or 8 year old PC, and don't want to invest extra money into it. Remember Windows XP? Support ended 5 years ago, but some PC users still run it, which is not a safe proposition. They are vulnerable to all sorts of malware attacks. So keep your desktop or laptop updated and secure, so you don't waste your money.